Guest post by Jens Hagendorff. The economy is always at the top of the headlines in most major news outlets, especially in the aftermath of the recent financial crisis. What is less reported is the nitty-gritty of the legislation being put in place to avoid this crisis happening again. Readers of specialist news outlets will be well appraised of such things (usually because they are employed in sectors that are affected by this legislation), but the general public is usually not well informed. Take a recent piece from Bloomberg for example, which suggests that new agreements on how much capital banks must keep could be violated by the EU. But what does it all mean? The reason that banks hold bank capital is to absorb the losses which banks may make in bad times. When losses are too big for this capital to pay off, banks either fail or, if bank failure is deemed too costly for the economy, banks will be bailed out. In practice, banks frequently get rescued by the taxpayer. Whether or not bank capital holdings are sufficient and in line with bank risk-taking is therefore an important question that is hotly debated amongst policymakers and in the press. The financial crisis that started in 2007 illustrates that international capital adequacy rules have failed to ensure that regulatory capital requirements are in line with the risk that banks take. This means that while banks were following the rules when it came to putting funds aside for a rainy day, they weren’t being required to put enough aside given how risky their investments were. So, when the investments failed, the banks failed as well. Some commentators argue that one reason banks held insufficient capital as they entered the crisis was because regulatory capital requirements were insufficiently attuned to the risk of bank activities. When banks are not subject to regulatory capital requirements that reflect their risk-taking, the ability of banks to survive economic shocks is likely to be at stake. The Basel Accord of 1988 introduced minimum capital requirements for international banks. It did so by requiring that banks hold a fixed proportion of their risky assets as capital to cover losses. How risky assets are is measured by what bank regulators call risk-weighted assets (RWA). In most countries, banks need to hold capital equal to 8% of their RWA. The Basel Accords are regularly updated, and the most recent version, Basel 3, is what the EU could be violating. But, does this RWA really measure the “true” risk in a bank’s assets? If it doesn’t, banks will be able to “game” the system, by investing in assets that have low RWA values but are still highly risky, and only putting aside a pitiful amount of capital to protect themselves. Many economic commentators have long argued that the latter is the case. The banks’ ability to game the system is illustrated nicely by the graph above. It shows the value of total assets, risk-weighted assets (RWA) and the proportion of RWA to total assets of the world’s largest 124 banks. 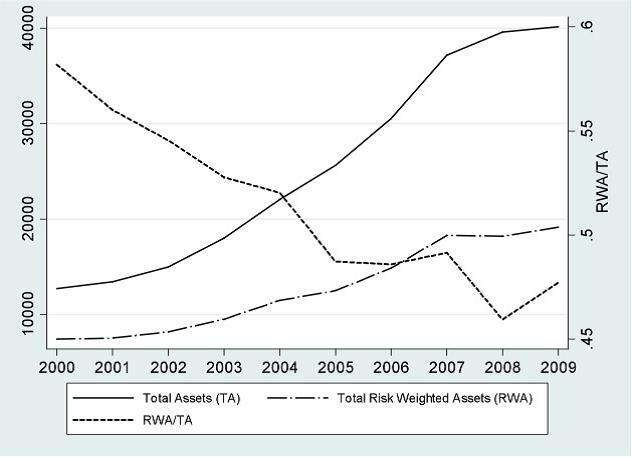 The proportion of RWA to total assets has been falling steadily since 2000. One way of interpreting this is that banks have become progressively less risky over time, taking on assets with lower risk. A different interpretation of the falling proportion of RWA on banks’ balance sheets is that banks have become increasingly adept at gaming the Basel rules resulting in lower RWA (and thus lower capital requirements) but probably no less risk. A recent study shows how risk sensitive the Basel capital requirements for banks really are. By examining the risk sensitivity of capital requirements for an international sample of large banks between 2000 and 2010, they showed that capital requirements are only loosely related to a market measure of the portfolio risk of banks. In other words, imagine a bank painting a picture of how their assets look, and the market collectively painting its own picture. The regulators have access to both paintings, but only act on the bank’s own work. What the study says is that the two pictures are only vaguely similar. Because these two pictures are so poorly related, even large increases in “true” portfolio risk generate only small increases in the amount of capital required. For example, if a bank’s market assessed risk increases by a factor of 3, then the capital required increases only by 0.78%. More recent modifications to the original Basel Accord (‘Basel 2’) were designed to solve this problem, and enhance the sensitivity of capital requirements to bank portfolio risk. But the study shows that, in many ways, Basel 2 has made things worse in terms of the risk-sensitivity of capital requirements. Basel 2 has introduced “asymmetric risk sensitivities” for low- and high-risk banks. This means that low-risk banks can actually reduce their capital requirements when adopting Basel 2. On the other hand, banks with high-risk portfolios are not required to hold significantly more capital when adopting Basel 2. This means that the riskiest banks are likely to hold insufficient capital under Basel 2, which is the exact opposite of what these accords are designed to do. So will recent revisions to capital requirements (what is called Basel 3) be sufficient to ensure that banks are required to hold capital in line with risk? The Basel 3 revisions are designed to increase both the quantity and quality of minimum capital holdings by further enhancing the risk sensitivity of capital requirements, and requiring banks to hold more capital. However, as long as the regulatory concept of risk exposure, which underlies the computation of RWA, remains so weakly related to risk (i.e. as long as the two paintings bear little resemblance to each other) the increases in capital requirements which are proposed will not be sufficient to cover the effective riskiness of banks. The projected increase in RWA under Basel 3 suggests that banks in our sample will only be required to hold on average 1.94% of additional capital (relative to assets). So what is to be done? Research supports a much more profound overhaul of capital adequacy rules than currently proposed. Academics are calling for an increase in capital requirements well above 10% of assets to improve the safety of the financial system. This is no mean feat, and concerns over bank lending mean that the phasing in of higher capital requirements will have to be carefully managed by policymakers and complemented by tight and efficient supervision. However, it is equally clear that the risk-sensitivity of Basel 3 is not adequate and attempts by Basel 3 to moderately improve the risk sensitivity of capital requirements will not be enough to address this issue. The Basel 3 revisions won’t come into effect until 2019, and further revisions will take even longer. Given how devastating the financial crisis of 2007 was to the global economy, policymakers and regulators will have to ensure that, for the sake of the world’s financial health, banks cannot game the system. « Are green spaces happy places?